Every January, the Scottish National Gallery displays some Turner watercolours in a dimly lit room. 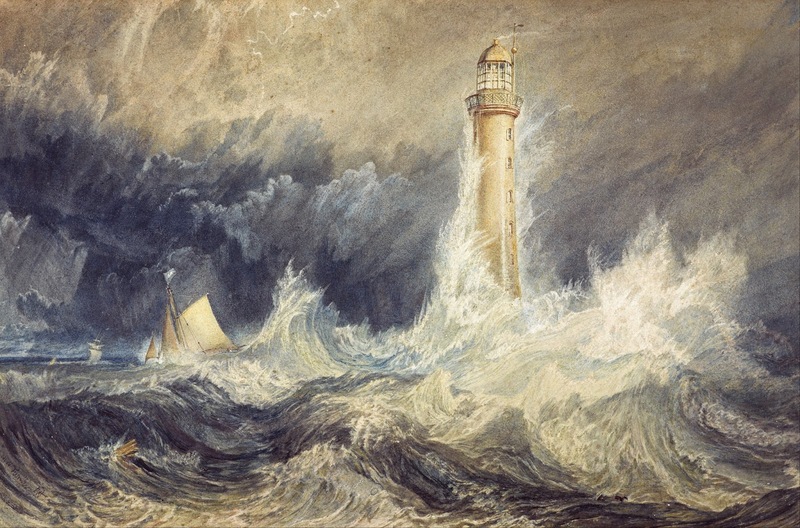 The collection includes the impressive 'Bell Rock Lighthouse' (1819). As a painting, it is both beautiful and functional. It is beautiful because it is. It is functional because, as the commission for the front cover of a book about Stevenson's lighthouse, it shows dramatically the purpose of the lighthouse, its engineering challenges, and even a hint at how the design addresses the challenges. The purpose of the lighthouse is illustrated by the ship that has come perilously close to the submerged rock which the lighthouse marks. The engineering challenge is to withstand the fierce storms that will drive ships on to these rocks. One aspect of the engineering solution is hinted at by the jet of water shooting up the side of the tower, up to the light itself: the short-lived extreme loads (forces and moments) must drive the design. This cross-section shows that the submerged base of the light-house is parabolic. Clearly the base benefits from being thicker than the tower, as waves hitting the tower cause moments on the base. However, the parabolic shape also deflects water motions from horizontal to vertical. When the jet of water collapses, it is carried away in a reflected wave. Perhaps the steep wave between the ship and lighthouse is the result of constructive interference between the wave receding from the previous run up of water on the tower, and the next incoming wave that will strike it? Encouraging a jet of water to shoot up the tower reduces the peak structural loads: some of the energy is dissipated by white water; some of the force that is difficult to withstand, a horizontal force against the tower, is converted to a force that is easy to withstand, a vertical force into the foundations. Furthermore, the jet of water takes time to travel up the tower, so the forces imparted are spread out over this time, which also brings down the maximum peak load.